LG 55in OLED TV to go on sale later this year for €9000 | What Hi-Fi? Not to be outdown by arch-rival Samsung, which has already announced its OLED TV plans, LG has revealed in Monaco that it plans to bring the "most advanced commercial OLED TV" to market in the second half of this year for €9000 (£7200). First unveiled at CES in Las Vegas last January, the LG 55EM960 will be just 4mm thick and weigh 10kg. It uses both LG's 4-Color Pixels – adding white to the usual array of red, green and blue – and the company's Color Refiner, which is said to improve colour rendition when the set is viewed off-axis. "In the history of television, there have been very few innovations as impactful as the coming of OLED TV," says havis Kwon, president and CEO of LG's Home Entertainment Company. "This year we plan to make OLED synonymous with LG." Unlike LCD or LED displays which require backlights, OLED TVs generate their own light, eliminating the need for backlighting all together. By using carbon fibre reinforced plastics (CFRP) for the exterior, LG's engineers have been able to create a product with a thickness of only 4mm and weighing a mere 10Kg. 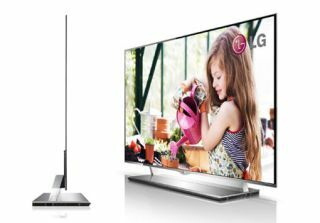 In addition, LG's 55in OLED TV incorporates the company's Cinema 3D technology with Smart TV functionality to create what LG describes as "the ultimate display OLED TV". Rival Samsung says it will launch its 55in OLED TV in South Korea during the second half of this year too, at a price of $9600.